At Martin Haskell’s Dayton [Ohio] abortuary, Wednesday and Thursday are ‘late-term‘ abortion days, at least two day procedures. Roslyn Kade was the abortionist yesterday; she was also the abortionist on duty last December when TWO ambulances were called on the same day. An ambulance and fire truck came; men with medical bags entered the abortuary and the woman was taken out by stretcher. On June 11, 2015, an eyewitness account says a woman from Indiana had been to the abortuary June 10 and did not ‘appear well’. The woman was ‘wobbly’, appeared to be ‘drugged up’ when she walked into the abortuary. Shortly after this, 911 was called. Hear that 911 call here as well as others through the years at the Dayton abortuary. Abortion is NOT safe for women and never safe for the innocent child targeted to die. Currently, Martin Haskell’s Women’s Med is working with a variance which means he cannot get his own hospital admitting privileges and uses another doctor who does. The Wright State Physicians is being used by Haskell to remain ‘legal’ while legislators are working on stopping this debacle with Haskell. The self professed ‘pioneer’ of the partial birth abortion rests easy in his home reaping the financial benefits of his abortion business while women are seriously injured during botched abortions. 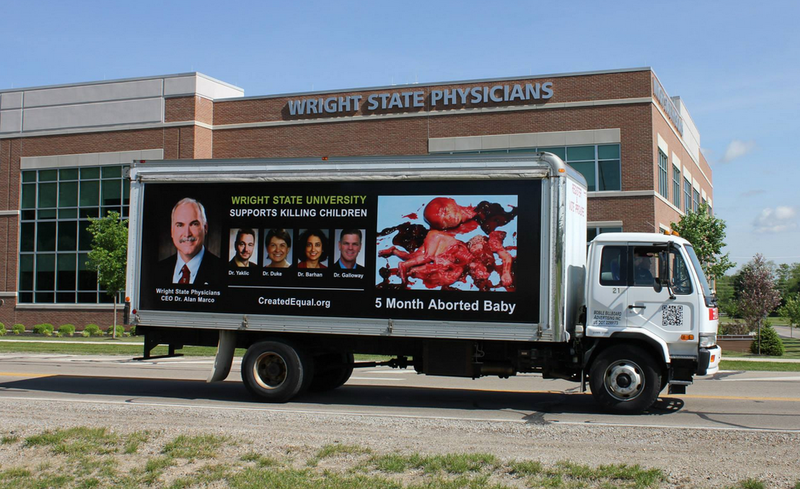 Recently, the prolife group Created Equal has made it a priority to show Daytonians, Haskell’s abortuary, local hospitals and Wright State Phyisicans the truth about abortion with their ‘Truth Truck’. The Truth Truck features the truth about abortion with aborted children and the names and photos of the ‘physicians’ who conspire with the abortion business at 1401 east Stroop Road in Kettering, a suburb of Dayton. We continue to pray that this endeavor will cut to the heart and soul of those who allow abortion in the Miami Valley, particularly Martin Haskell and Roslyn Kade, for their despicable career of child killing. We are asking everyone to pray for the young woman taken by ambulance yesterday. Also pray that Martin Haskell, Roslyn Kade, Wright State Physicians, Ohio pro-abortions groups, voters and the local community to see what abortion truly is: MURDER. Thank you to all who pray and counsel pre-abortive women and men, and bring these truths to the public.